I know of several restaurateurs who had a look at moving into the Highcross restaurant quarter but were put off by the rents. The only independent to bite the bullet and take it on from the earliest days was Memsaab, which had been open – on and off – round the corner on Vaughan Way for a few years. They decided to tackle the challenge by keeping more or less the the same menu but taking the place upmarket, and it’s good to report they’re making a very able job of it. You enter into a champange and cocktail lounge , where you are also likely to be serendaded by a live pianist and vocalist. Ok the red and black colourscheme is a bit hackneyed, but visiting on a Saturday after a dispiriting home defeat to Reading, the lively buzz about the place immediately started to cheer me up. There were several big birthday parties in but the layout of the place enables the larger groups and couples and smaller groups to be separated out. Our table for four was in the glass walled section that has a pleasing view over the urban bustle of Highcross. So full marks for the atmosphere, but fortunately the food is well up to the mark too. It’s a fairly traditional offering – and doesn’t really reach the culinary heights of its Nottingham namesake – but is nonetheless consistently impressive. Poppadoms came with a superior set of chuntneys. A starter of chicken shashlick was excellent – three huge chunks of succulent, marinated chicken breast that showed a generous and adventurous hand with the spices. Chicken and fish pakora, coming with a lively coriander relish, were very made and well cooked too – the fish was so good it really should be offered as a choice on its own. Chilli tiger prawns showed plenty of bite and again the cooking of the prawns was excellent. Considering the sizeable groups that were being served, the kitchen was doing a fine job at getting out the orders on time and in good shape. Our mains courses dishes all convinced – quality ingredients, lively spicing and accurate cooking. Lamb dehi wala was mild and yoghurty, vegetable dhaaalcha was far more interesting than lentils and chickpeas might suggest while parathas were flakey and flavoursome. Service was good – welcoming and thoughtful. A minor accident in serving the pakora was dealt with speedily and correctly. There’s a special place in all hearts for our favourite neighbourhood Indian restauarant, a fact that can make us wary of places that offer a bit more glamour. But Memsaab pulls it off very well. In the absence of restaurant stuff – I’ve not been able to get out much recently – let me remind readers of a couple of upcoming events. 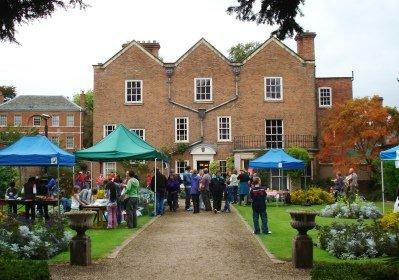 Belgrave Hall Good Food Fair is a lovely little event taking place this year on 18 and 19 September from 11am to 4pm. It’s a farmer’s market type gethering in the beautiful gardens of this 18th century gem – a quiet little haven right next to the busy Loughboorugh Road in Leicester. As well as retail opportunities there’s usually a couple of entertaining little displays put on and it’s well worth a couple of hours visit. Entrance £1/kids free. Much bigger in scale is the East Midlands Food Festival, 2-3 October at Brooksby Hall, near Melton Mowbray. For those who’ve never been, this is the region’s biggest such event attracting several thousand visitors and hundreds of exhibitors. I generally come back with sackfulls of chutney because that’s my particular weakness, but those with a penchant for cheeses, rare breed and exotic meats, breads, beers, kitchen equipment and whatever are well catered for. Must admit I give the kitchen demonstrations a miss but if you have a thing about c-list TV chefs then that could be the clincher. Entrance this year has been reduced to £5 when you pre-book. The two events bookend Leicestershire Food Fortnight, which also sees a fair few local producers putting on tasting events or demostrations and tours, while some restaurants are putting on gourmet evenings. For a brochure of events visit Go Leicestershire . One final piece of news – a third branch of Kayal is set to open today in Leamington Spa, bringing its enticing Keralan menu and high standards of service to a new audience in the West Midlands. Good luck to Jaimon Thomas and his team. I’ve taken some gentle teasing over my berry obsession but the way I see it is they are not here for long so we may as well make the most of them. Thus an afternoon off saw me trundle out to Seldom Seen Farm near Billesdon. This farm always make me think of that idealised farm in the film Babe – it’s several miles from other human habitation and is set in a deep little valley, with bright green swards brightened by big flocks of noisy, pure white geese running around in tight formation like schools of fish. The farm may be known to many for its Rick Stein approved geese at Christmas time, but the rest of the year it makes a living through arable and fruit. I got stuck in and bought (could have gone PYO but time was tight) some wonderfully chubby rasperrries, blackberries, redcurrants and Worcesterberries (a gooseberry and blackcurrant cross). So, having rather splurged what would I do with them? 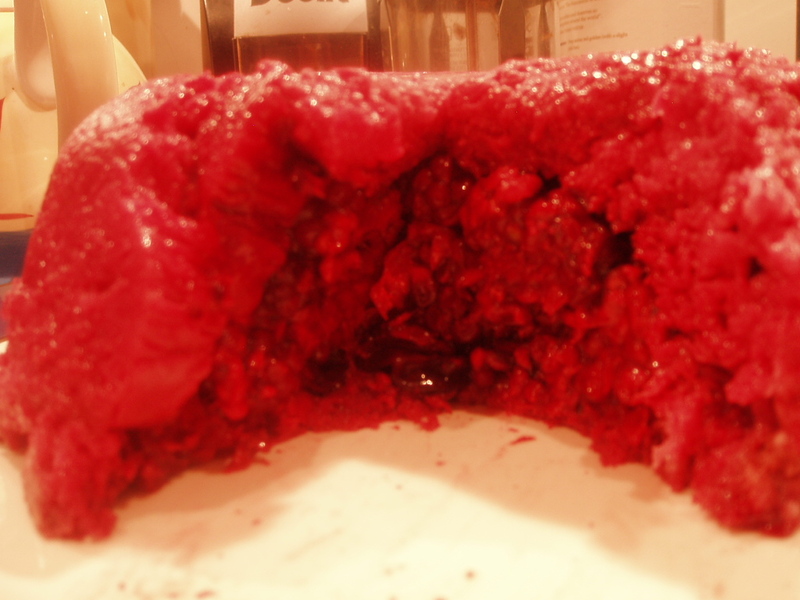 First off it had to be a summer pudding – possibly the easiest but most rewarding desert for the time of year. Stew up a selection of berries with a splash of water and sugar to taste, line a bowl with slices of white bread (a little stale is fine), fill the bowl with the cooled bery mix, top with bread and leave to mature for a day or two with a plate and weight on top. The result is always a highlight of my year – especially served with some clotted cream. Then what? Raspberry and white cheesecake of course. 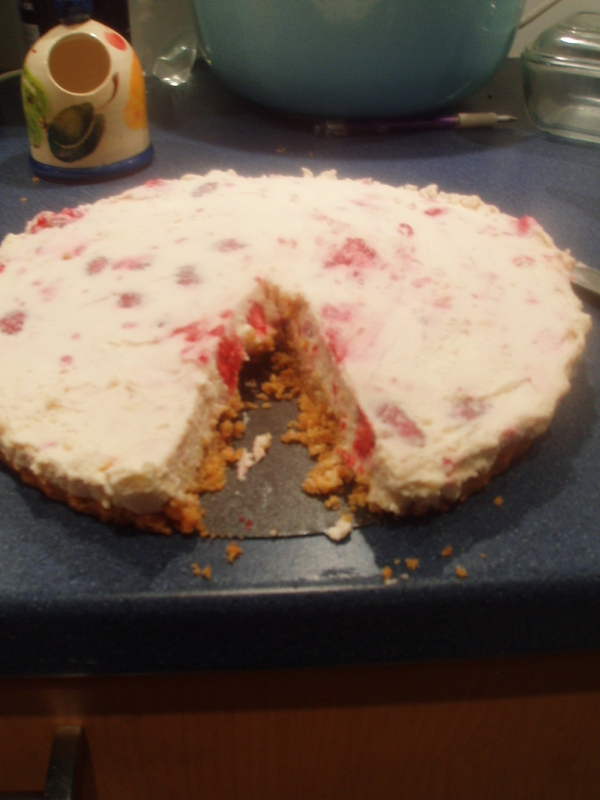 I followed an easy no-bake recipe – melting white chocolate with a little butter over water, mixing a little sugar with cream cheese (I used a mixture of ricotta and philadelphia), chucking in some raspberries and pouring over a base of mashed digestives mixed with melted butter in aloose-bottom tart tin. It then just takes overnight for the whole lot to set. You’ll need a sweet tooth, but oh my it’s good. The remaining redcurrants I made into a jelly which will go with a leg of lamb eventually. 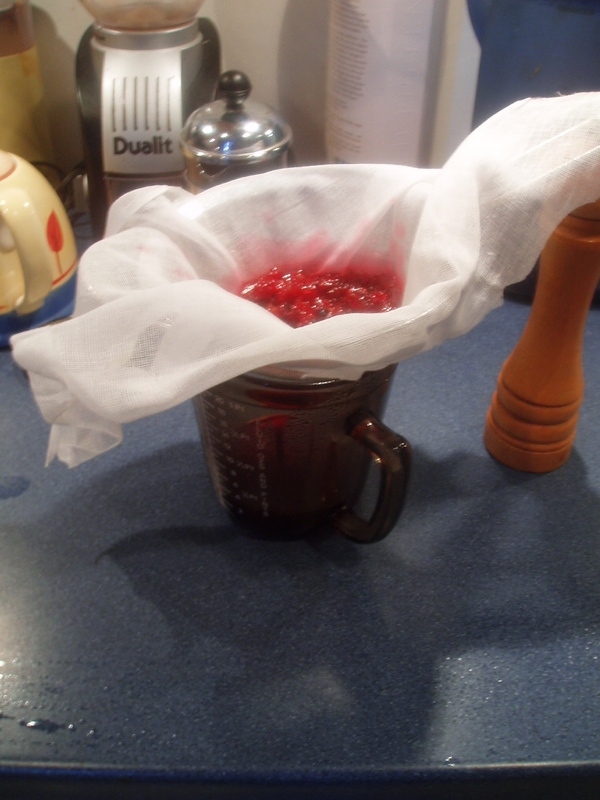 They are full of pectin so it’s a fairly easy process of just simmering the berries with an equal quantity of sugar for 20 minutes and then pouring into a muslin-lined sieve and letting it drip through. Decant it into a sterilised jar (just heat it carefully in the oven for a bit) and it sets very quickly. Finally a big cake. 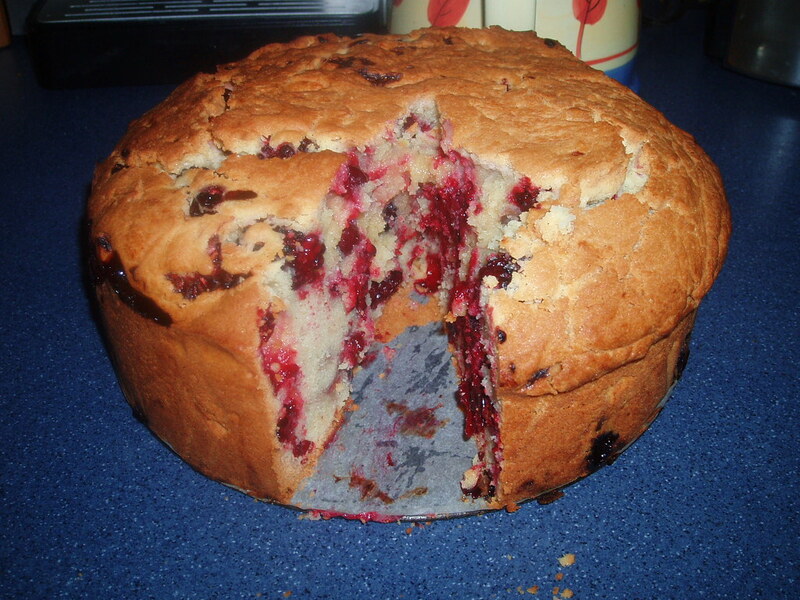 I made a basic cake mix and chucked in a range of fruit before baking. I suppose it’s like a standard fruitcake but using fresh summer berres instead of dried fruit and nuts is a revelation – the little explosions of sweetness, tartness and intense flavour make it an exciting eat. Right, that’s enough about berries. There’ll be still some around for a couple of weeks if I’ve inspired anyone. If you want to glimpse Seldom Seen farm, it’s signposted off the A47 just past Billesdon. The recipes given here are deliberately sketchy because you’ll all have your own preferred methods and tastes, but if you want full version just let me know. Many Leicestershire people will have rocked up at the Nevill Arms in Medbourne on a warm Sunday lunchtime, sat outside with a pint by the little stream and the ducks and declared that this, without doubt, is the life. This weekend was actually the first time I’ve been for a good number of years and I hadn’t realised that the pub has now developed a thriving bed, breakfast and cafe business and also has a sizeable restaurant out the back. We went early for a post-work Friday wind down and ended up have a very pleasant dinner. My lamb steak wasn’t the best piece of meat I’ve had this month but it was tasty enough and taken together with a spicy ratatouille and nicely-done cous cous it formed a perfectly decent dish. Deborah’s pancetta wrapped chicken breast was excellent and the accompanying potato cake cooked in duckfat was really first rate. Homemade deserts were superior – a light and airy chocolate torte with some earl grey clotted cream, and a passionfruit cheesecake with a minty mango salsa. Nothing here was remarkable but it was solid good cooking at a fair price, served up by friendly and competent young staff. There’s a “Riverbank” bar menu of snacks and all in all, given the loveliness of the setting, there’s enough to keep the Nevill very much on your radar for country pubs where you might want to eat.